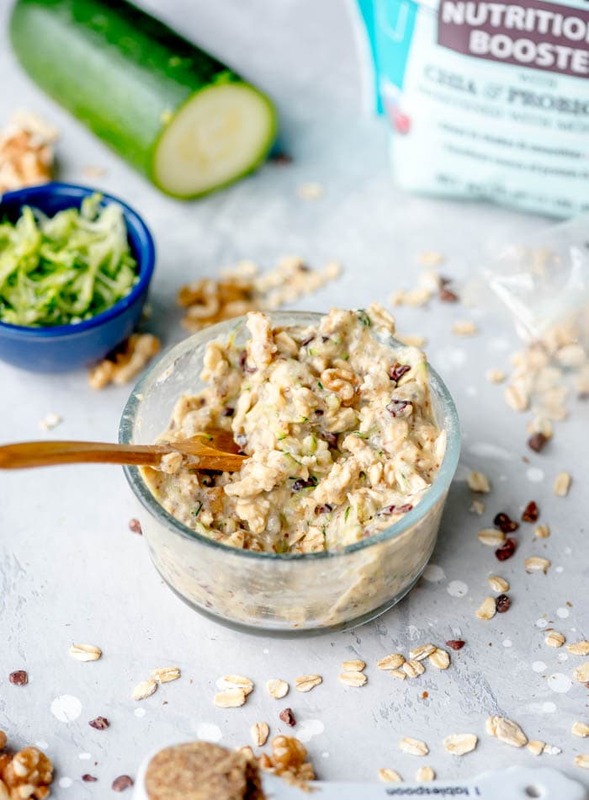 You can make these chocolate chip zucchini overnight oats a few different ways. You can go with chocolate protein for double chocolate zucchini overnight oats or go with vanilla protein for chocolate chip zucchini bread flavour. You can also make them stovetop, which if you have bit more time in the morning, is a nice way to enjoy a warm breakfast bowl rather than cold overnight oats. Whether you cook them stovetop or go for overnight oats, both taste great and are a sneaky way to get some extra veggies in at breakfast. Disclaimer: This post is sponsored by Bob’s Red Mill. All opinions are my own and I use Bob’s Red Mill in my recipes regardless of this partnership. Thanks for supporting the brands that support Running on Real Food! To boost the protein content in this recipe, I used Bob’s Red Mill Vanilla Protein Powder. It was the perfect choice and I love the sweet vanilla flavour and the doughy texture it creates. 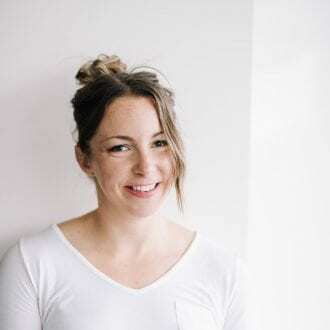 Their protein powder is one of my favourite vegan nutrition boosters because it’s made with just a handful of ingredients, it’s sweetened naturally with monk fruit and has added chia seeds. It tastes awesome in overnight oats, smoothies and baking. I used vanilla but you could also use their chocolate protein powder in this recipe. Nutritionally it’s pretty great too. Just one serving contains beneficial probiotics, 35% of your daily iron, 12 gram of dietary fibre, 20 grams of plant-based protein and 240 mg of omega-3 essential fatty acids. I love it! Flax seeds are one of my top recommend healthy foods to add to your diet. Did you know that flaxseeds are one of the best disease-fighting, longevity-promoting plant foods there is? Just 1 tbsp of ground flaxseed daily is enough to take advantage of their many health benefits, so I add them to my smoothies or to my oats every day. Some other easy ways to eat flaxseeds are on yogurt or hot and cold cereal, in baking, homemade energy bars or smoothies and on toast, soups and salads. Flax seeds are inexpensive and easy to incorporate into your diet, just make sure you eat ground flaxseeds and not whole ones, unless you want to poop them right out! You can buy flaxseeds either ground or whole but if you’re buying ground flax just make sure you use it within a few months and store it in the freezer to keep it as fresh as possible. You also want to look for ground flax that comes in opaque packaging, as Bob’s Red Mill Ground Flax does, as ground flax can be damaged by light. In addition to being the richest plant source of omega-3 fatty acids, flaxseeds contain one hundred times more lignans than other foods. Lignans are phytoestrogens that help lessen the effect of the body’s own estrogen, which has positive implications for breast and prostate cancer. The fibre in flaxseeds may also have preventive effects against colon cancer. Studies on the benefits of flaxseeds are many. In one such study, flaxseeds were shown to be 2-3 x more effective than anti-hypertensive drugs in reducing blood pressure, without any of the side effects. They’ve also demonstrated to help control cholesterol, triglyceride and blood sugar levels, and reduce inflammation. As far as cancer research, flaxseeds have been studied as a potential dietary alternative or adjunct to currently used breast cancer drugs and as for prostate cancer, researchers have evidence to suggest that flaxseeds are a safe, low cost source of nutrition and may reduce tumor-proliferation rates. They contain alpha-linolenic acid which has been strongly linked to brain health. 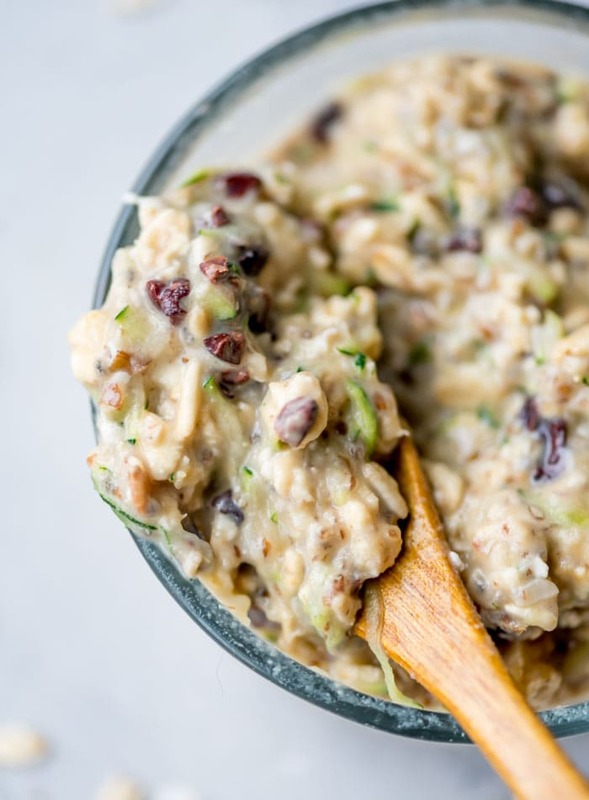 It’s been a while since I shared an overnight oat recipe but they’re still one of my go-to breakfasts, especially if I have a busy morning the next day. They’re also great as a post-workout meal you can bring to the gym with you to start re-fuelling right after your workout. I’ve been adding zucchini to my oats for years. 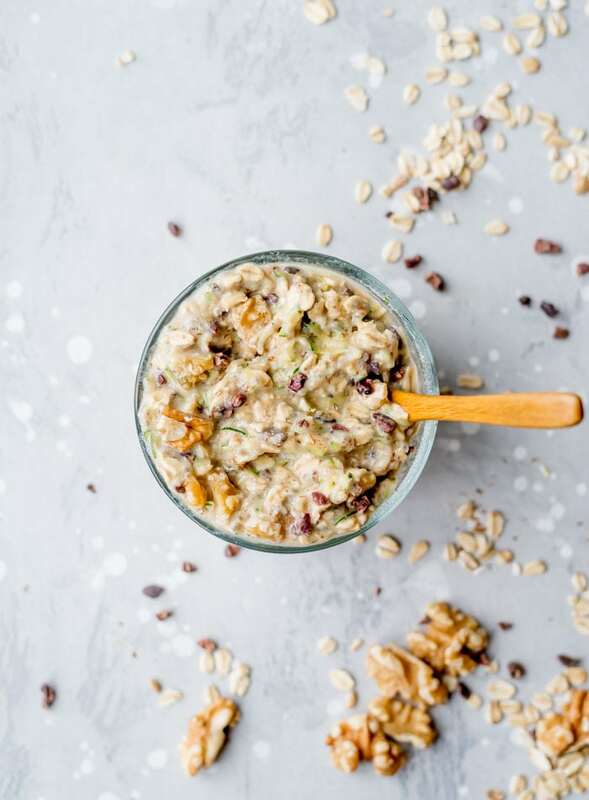 I love the volume, fibre and nutrition it adds to breakfast and combined with cacao nibs, oats and vanilla protein, you’ll love it mixed into these overnight oats. 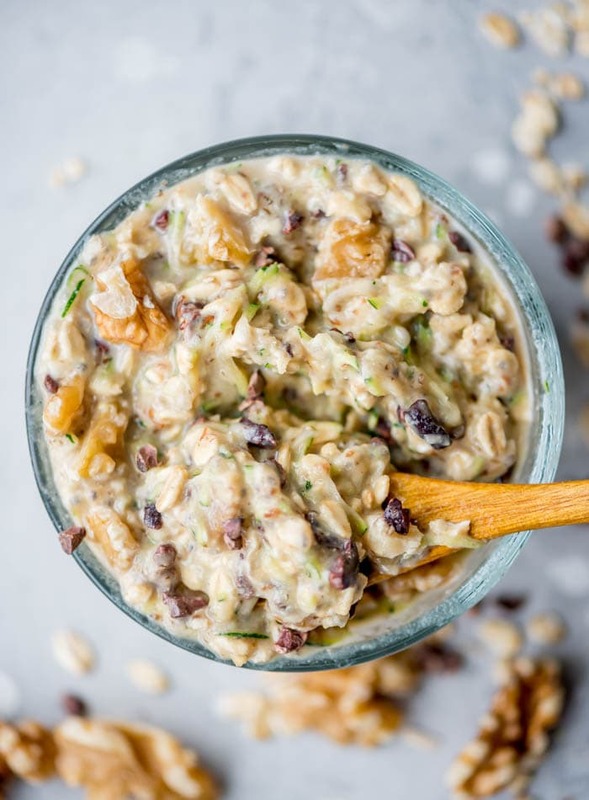 So what’s in these chocolate chip zucchini overnight oats? 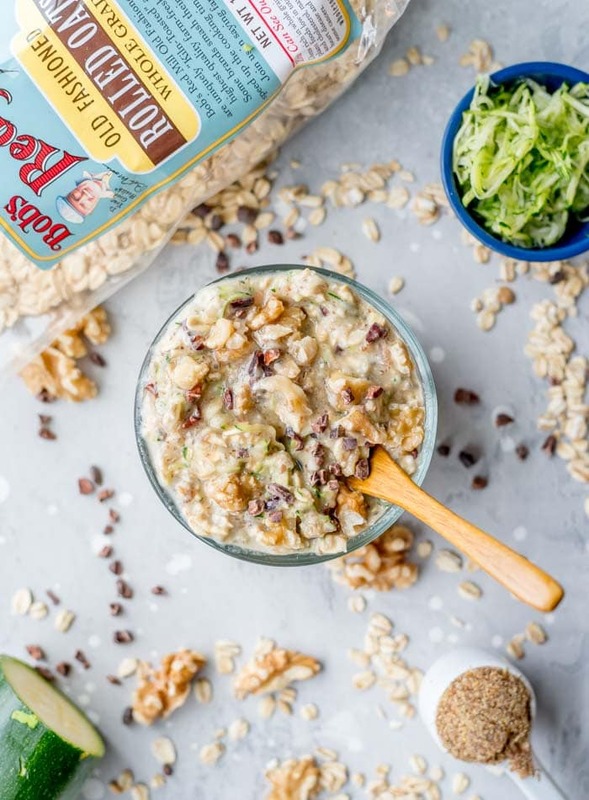 Delicious and heart-healthy, fibre-rich Bob’s Red Mill Rolled Oats. Bob’s Red Mill Vanilla Protein Powder for flavour and a doughy texture. Pure vanilla extract for extra flavour. Nutrient-dense cacao nibs for crunchy chocolate bits in every bite. Grated zucchini for nutrition, volume and flavour. To make this recipe stovetop, add the oats to a small saucepan with 1 cup of water and cook for 3-5 minutes until starting to thicken. Stir in the rest of the ingredients and add some milk or water to reach your preferred thickness. 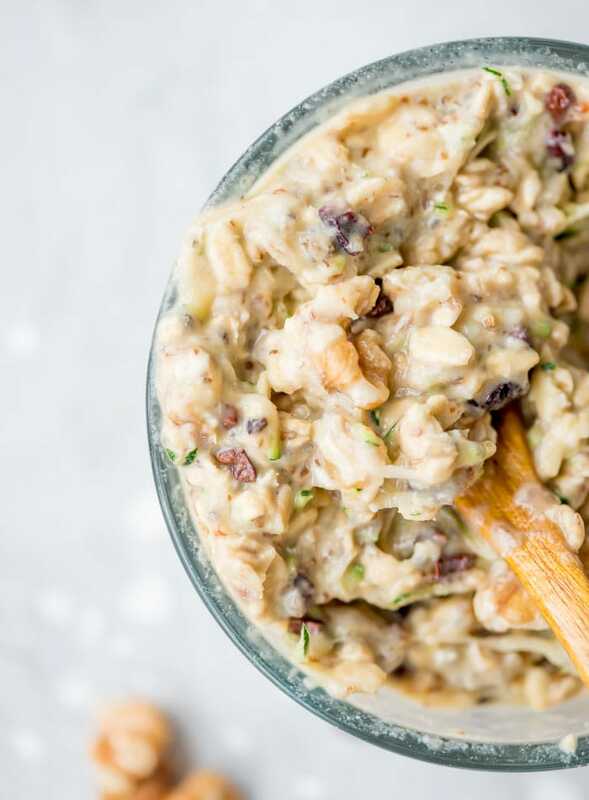 This recipe makes one serving of chocolate chip zucchini overnight oats. If you follow the recipe exactly, you’ll be enjoying a whopping 25 grams of dietary fibre, half fo your daily iron and calcium, about 1/4 of your daily vitamin A and vitamin C, 34 grams of plant-based protein, 17 grams of healthy fats and an energizing 62 grams of complex carbohydrates ready to power up your morning. For more Bob’s Red Mill goodness, check out my Gluten-Free Date Squares, Healthy Whole Grain Porridge and Vegan Thumbprint Cookies. For more overnight oats, check out my Brownie Batter Overnight Oats, Strawberry Cheesecake Overnight Oats and Carrot Cake Overnight Oats. These overnight oats taste like dessert but are loaded with nutrition such as fibre and plant-based protein. 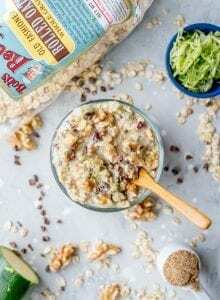 They take just minutes to prep so you can wake up to chocolate chip zucchini bread oats anytime you want too! Add all of the ingredients to a container and stir well to thoroughly combine. Place in the fridge for at least 3 hours up until overnight. If it seems too thick you can add a small amount of extra milk. I like my overnight oats really doughy and thick so 3/4 cup was the right amount for me. 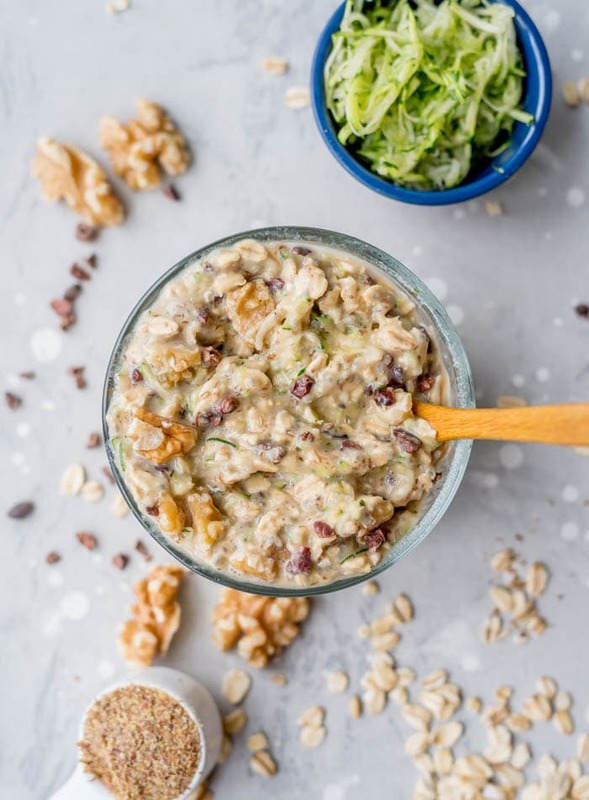 Add any desired toppings such as walnuts and a drizzle of maple syrup and enjoy! Additional topping ideas: 1/2 sliced banana, 1 tbsp almond butter, extra cacao nibs, 2 tbsp shredded coconut, 2 tbsp walnuts, drizzle of maple syrup. I really like that you used cacao nibs in this! I’m one of the rare people who doesn’t like chocolate with grains, but cacao nibs are another ball game! I just love how crunchy they are, that they’re sugar-free, have lots of nutrients and I love the rich, dark chocolate flavour! What a great way to sneak in more veggies! I love the combination of flavor here! You KNOW I’m all about this! I love zucchini bread so this is my jam!!! 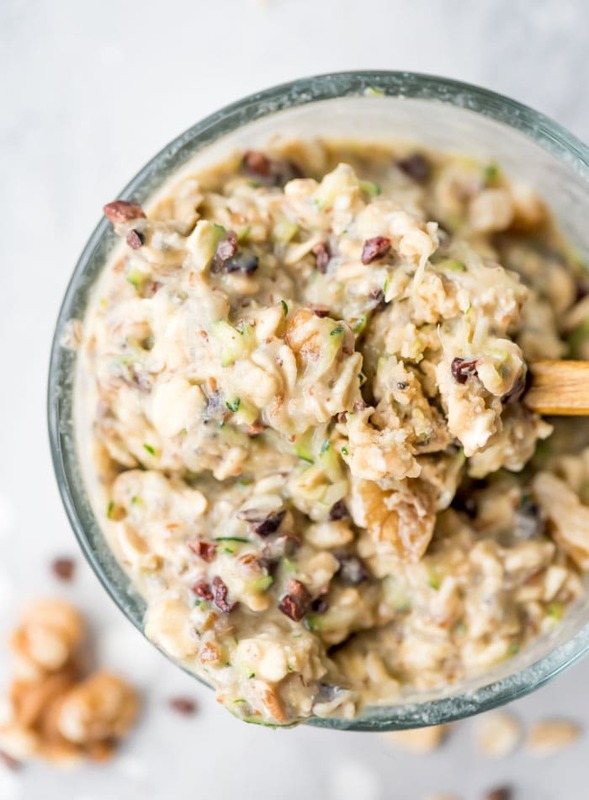 These overnight oats look so filling and delicious! I bet this tastes amazing with the chocolate chips and zucchini! These look delicious! I’ve never tried it with zucchini before but I am looking forward to it! Also love the addition of flax seeds! Thanks for the spectacular recipe Deryn! I was just reading an article on the benefits of flax seeds and it said that flax seed has “75 to 800 times more lignans than other plant foods.” On top of that it also said that in the 8th century, King Charlemagne passed laws that required his subjects to consume it because he believed so strongly in its health benefits. I try to eat them everyday and the more I read about them the more I am convinced of their incredible health benefits!